Why does Shaquille O'Neal continue to be bothered by Dwight Howard's appropriation of the Superman nickname? Shaquille O'Neal and Dwight Howard have a history. O'Neal has been critical of Howard throughout his career, often stating that he's too tentative to be dominant;Â and Dwight has expressed his desire for Shaq to shut up. However, the biggest bone of contention between the two big men involves a simple nickname. Shaquille O'Neal and Dwight Howard have a history. O'Neal has been critical of Howard throughout his career, often stating that he's too tentative to be dominant; and Dwight has expressed his desire for Shaq to shut up. However, the biggest bone of contention between the two big men involves a simple nickname. 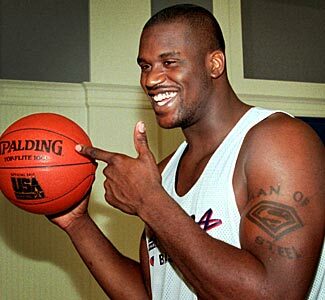 Early in his career, Shaq fell in love with calling himself "Superman," even tattooing the iconic "S" logo on his left bicep. Years after Shaq took "ownership" of the nickname, Dwight Howard also began referring to himself as Superman. Shaq was none-to-happy about Dwight adopting his moniker, and he lashed out in the media on the subject back in 2010. It's a funny picture, but why does Shaq still feel the need to fight this battle? The Rockets are playing like garbage! Howard's scoring numbers are the lowest they've been since his rookie season! No one even calls him Superman anymore! It would be wise for Howard to take the high road and avoid engaging in yet another war of words with O'Neal over his immature taunt.